Janet P. Sutton, Ph.D., and Claudia A. Steiner, M.D., M.P.H. MRSA typically is classified as hospital acquired; health care acquired, community onset; or community acquired, community onset. Hospital-acquired MRSA usually is the result of a nosocomial infection, often acquired following a surgical or invasive medical procedure during a hospital stay. Health care-acquired MRSA develops outside the hospital while the patient is in the community and has had recent contact or received treatment in a health care facility, such as an inpatient hospital, ambulatory surgical center, dialysis center, or nursing facility.3 Community-acquired MRSA occurs among community-dwelling individuals without recent hospitalization or encounters with the health care system. This HCUP Statistical Brief examines inpatient hospital stays with MRSA in California in 2013. Inpatient stays are categorized by clinical condition associated with MRSA—pneumonia, septicemia, cellulitis or skin ulcers, complications following surgery or medical care, and other clinical conditions. Patients with a MRSA-associated hospital admission who acquired the infection during the course of the hospitalization are then compared with those who acquired the infection following receipt of treatment or care in a health care facility in the past 90 days or who acquired the infection in the community. Health care facilities include inpatient hospital settings, emergency departments, and ambulatory surgery facilities. Differences greater than 10 percent are noted in the text. Figure 1 presents data on the percentage of MRSA-related inpatient stays in California hospitals by clinical condition. If a patient had more than one stay in the year, each inpatient stay is counted separately. In 2013, over 1 out of 100 inpatient stays at California hospitals—a total of 37,627 stays—had a principal or secondary MRSA diagnosis. A total of 42 percent of MRSA-related hospitalizations included a cellulitis or skin ulcers diagnosis. About 17 percent of stays had MRSA pneumonia, and 16 percent had MRSA septicemia. Over 17 percent of patients with a MRSA diagnosis were hospitalized with MRSA two or more times during the year. Only 8 percent of patients developed MRSA during a hospital stay. About 42 percent of patients with a MRSA-related hospital stay had been hospitalized, were seen in the emergency department, or had undergone ambulatory surgery in the 90 days prior to the MRSA stay. About 50 percent of patients were hospitalized with community-acquired MRSA. Half of patients with community-acquired MRSA had a diagnosis of cellulitis or skin ulcers. Among patients with hospital-acquired MRSA, the largest proportion (38 percent) were diagnosed with pneumonia. 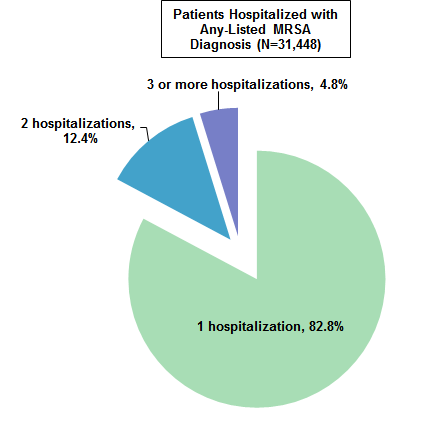 Figure 1 is a pie chart that shows the percentage of MRSA-associated hospital stays in California in 2013 by clinical condition associated with MRSA. Septicemia: 15.9; pneumonia: 17.0; cellulitis and skin ulcers: 41.9; complications of surgery or medical care: 7.4; other: 17.8. In California in 2013, 1 out of every 100 inpatient stays involved MRSA. Approximately 1.2 percent of the over 3.1 million hospital stays that occurred in California in 2013—a total of 37,627 stays—had either a principal or a secondary MRSA diagnosis. Thus, in California, just over 1 out of every 100 hospital stays in 2013 involved MRSA. Over 40 percent of MRSA hospital stays were associated with a diagnosis of cellulitis or skin ulcers. MRSA cellulitis and skin ulcers accounted for 41.9 percent of all MRSA inpatient stays. MRSA pneumonia and septicemia accounted for 17.0 percent and 15.9 percent of MRSA stays, respectively. Complications following surgery or medical care accounted for 7.4 percent of MRSA hospital stays. Unspecified bacterial infection was the leading diagnosis among MRSA-associated hospital stays categorized as involving other clinical conditions. Among MRSA stays with other clinical conditions (i.e., those without a diagnosis of septicemia, pneumonia, cellulitis or skin ulcers, or complications of surgery or medical care), approximately 10.2 percent had a diagnosis involving an unspecified bacterial infection. Nutritional, endocrine, and metabolic disorders accounted for 3.5 percent of other MRSA hospital stays, and fluid and electrolyte disorders, anemia, and diabetes mellitus with complications each accounted for about 3 percent of other MRSA hospital. Data are not shown. Figure 2 displays the number of single and multiple hospitalizations among patients with a MRSA-associated admission that occurred during 2013. The subsequent analyses track patients across multiple MRSA hospitalizations. Patients are counted once rather than counting each hospital stay. Figure 2 is a pie chart that shows the percentage distribution of MRSA-associated hospital stays among patients with at least one MRSA admission in California in 2013. Patients with 1 MRSA hospitalization: 82.8; 2 MRSA hospitalizations: 12.4; 3+ MRSA hospitalizations: 4.8. More than 1 out of 6 patients with a MRSA-associated admission were hospitalized on two or more occasions. During 2013, 12.4 percent of patients with MRSA experienced two hospitalizations and 4.8 percent of patients had three or more MRSA-associated admissions. Accounting for multiple hospitalizations, a total of 31,448 patients were admitted to a California hospital with a MRSA-associated diagnosis in 2013. Table 1 presents data on the demographic characteristics of the 31,448 patients who were hospitalized with a MRSA diagnosis in 2013. Notes: Clinical condition and patient characteristics were defined at the patient's first MRSA hospital stay in 2013. The distribution of patients by age and race/ethnicity differed by the clinical condition associated with MRSA. MRSA cellulitis and skin ulcers were more frequent among younger patients, whereas septicemia, pneumonia, and medical/surgical complications were more frequent among older patients. Approximately one in four MRSA patients with cellulitis or skin ulcers was under the age of 45 years. In comparison, only 13.3 percent of MRSA septicemia patients and 8.7 percent of MRSA pneumonia patients were under the age of 45 years. In comparison, two-thirds (66.7 percent) of MRSA pneumonia patients and over half (52.2 percent) of MRSA septicemia patients were aged 65 years and over. More than 1 in 5 patients with MRSA pneumonia were aged 85 years and older compared with 1 in 10 patients with a MRSA cellulitis or skin ulcers diagnosis, or complications of surgery or medical care diagnosis. Small differences in distribution by race/ethnicity were observed, with the proportion of non-White patients highest for those with a MRSA septicemia diagnosis (43.2 percent) and lowest for those with a complication of surgery or medical care (39.0 percent). The proportion of patients covered by Medicare, Medicaid, and other expected payers varied significantly by clinical condition associated with MRSA. Medicare covered hospitalizations for 71.8 percent of patients with MRSA pneumonia, 64.1 percent of patients with MRSA septicemia, and 48.0 percent of patients with a cellulitis or skin ulcers diagnosis. Medicaid covered 13.9 percent of patients with MRSA pneumonia, 16.6 percent of patients with MRSA septicemia, 16.4 percent of patients with medical/surgical complications, and 20.4 percent of patients diagnosed with MRSA cellulitis or skin ulcers. Private insurance coverage ranged from a low of 10.0 percent among patients with MRSA pneumonia to a high of 17.4 percent among patients with a complication of surgery or medical care. 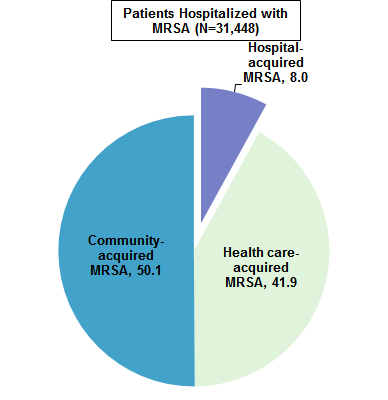 Figure 3 displays the percentage of patients who acquired MRSA during the same hospitalization or developed MRSA outside of the hospital. Note: Data are limited to the patient's first MRSA hospital stay in 2013 and records with a valid present on admission indicator. Source: Agency for Healthcare Research and Quality (AHRQ), Center for Delivery, Organization, and Markets, Healthcare Cost and Utilization Project (HCUP), State Inpatient Database (SID), California, 2013. 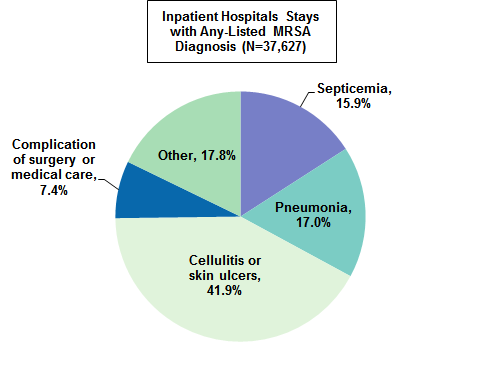 Figure 3 is a pie chart that shows the percentage of patients with a MRSA-associated hospital stay in California in 2013 by type of MRSA. HA-MRSA: 8.0; HCA-MRSA: 41.9; CA-MRSA: 50.1. Fewer than 1 in 10 patients acquired MRSA during the course of the same hospital stay. An estimated 8.0 percent of patients with a MRSA-associated hospital stay acquired MRSA during the course of their stay. Nearly 42 percent of patients were hospitalized with health care-acquired MRSA, meaning the patient had a hospitalization, a visit to an emergency department, or a visit to an ambulatory surgery setting in the 90-day period prior to the MRSA-associated hospitalization. About 50 percent of patients had community-acquired MRSA, meaning that the patient had no hospitalization, visit to an emergency department, or visit to an ambulatory surgery setting in the 90-day period prior to the MRSA-associated hospitalization. Figure 4 displays the clinical conditions associated with the type of MRSA admission. Figure 4 is a stacked bar chart that shows the percentage of patients with any-listed MRSA diagnosis in California in 2013 by type of MRSA. HA-MRSA: septicemia: 15.9; pneumonia: 38.0; cellulitis & skin ulcers: 8.2; complications of surgery or medical care: 14.0; other: 23.9. HCA-MRSA: septicemia: 16.4; pneumonia: 14.4; cellulitis & skin ulcers: 42.3; complications of surgery or medical care: 8.0; other: 18.9. CA-MRSA: septicemia: 13.4; pneumonia: 14.5; cellulitis & skin ulcers: 49.5; complications of surgery or medical care: 4.2; other: 18.5. One half of patients with community-acquired MRSA had a diagnosis of cellulitis or skin ulcers. Among patients with hospital-acquired MRSA, the largest proportion were diagnosed with pneumonia. Half of patients with community-acquired MRSA (49.5 percent) were diagnosed with cellulitis or skin ulcers compared with 42.3 percent of patients with health care-acquired MRSA and only 8.2 percent of patients with hospital-acquired MRSA. 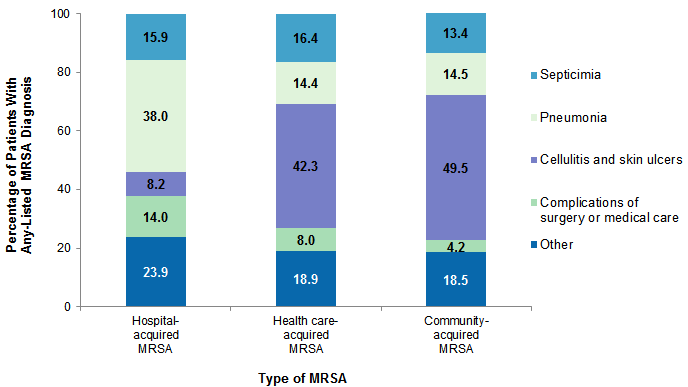 Fewer than one in five patients in each MRSA category was diagnosed with septicemia: community-acquired MRSA (13.4 percent), health care-acquired MRSA (16.4 percent), and hospital-acquired MRSA (15.9 percent). Among patients with hospital-acquired MRSA, the largest proportion (38.0 percent) were diagnosed with pneumonia. In contrast, substantially smaller proportions of patients with community acquired MRSA (14.5 percent) and health care-acquired MRSA (14.4 percent) were diagnosed with pneumonia. This Statistical Brief reports on hospitalizations for MRSA-related stays using the 2013 California State Inpatient Database (SID). In order to categorize whether a patient had a hospital-acquired, health care-acquired, or community-acquired MRSA-associated hospitalization, the 2012-2013 California SID, State Emergency Department Database (SEDD), and State Ambulatory Surgery and Services Database (SASD) were used to assess whether the patient had an inpatient, emergency department, or ambulatory surgery encounter within 90 days prior to the MRSA inpatient admission date. The principal diagnosis is that condition established after study to be chiefly responsible for the patient's admission to the hospital. Secondary diagnoses are concomitant conditions that coexist at the time of admission or that develop during the stay. CCS categorizes ICD-9-CM diagnoses into a manageable number of clinically meaningful categories.5 This clinical grouper makes it easier to quickly understand patterns of diagnoses. The CCS corresponding to the top Other MRSA diagnoses are identified in Table 2. MRSA admissions were identified with the principal or secondary diagnosis codes listed in Table 3. For the subgroup of admissions with multiple MRSA diagnosis codes, the following hierarchical assignment was used: septicemia; pneumonia; cellulitis and skin ulcers; complications of medical device, surgical procedure or medical care; other. Individuals with multiple MRSA admissions were identified as any patients with a principal or secondary MRSA diagnosis who experienced one or more hospitalizations with a MRSA principal or secondary diagnosis during the calendar year. With the exception that the second admission had to occur during the same calendar year, no restriction was placed on the number of days between the index hospitalization and the following MRSA admission. For Figure 1 of this Brief, the unit of analysis is the hospital discharge (i.e., the hospital stay), not a person or patient. This means that a person who is admitted to the hospital multiple times in 1 year will be counted each time as a separate admission to a hospital. For subsequent analyses, the unit of analysis is the patient. This Statistical Brief uses an encrypted linkage number provided by California in the State databases to track patients across time. Patients with multiple MRSA admissions were identified as those with two or more hospitalizations occurring at any time within the 2013 calendar year, regardless of the number of days between hospitalizations. For the subgroup of patients with multiple MRSA admissions, data on patient-level characteristics, diagnosis, and prior utilization of health services (which was used to identify patients with health care-acquired MRSA) were gathered from records corresponding to the index admission. The index admission was determined as the first admission in the 2013 calendar year with a principal or secondary MRSA diagnosis. Patients represented in these analyses include those aged 1 year or older. The present on admission (POA) indicator provides information on whether a condition was present at the time the patient was admitted to the hospital or the condition developed between the time that the patient was admitted and discharged from the hospital. Hospitals included in this analysis were restricted to those with reliable reporting of the POA indicator. Hospitals were dropped from the analysis based on the following edit checks: (1) all diagnoses were listed as POA for all discharges, (2) POA indicator was missing on all non-Medicare discharges, or (3) hospital reported POA as missing on all diagnoses nonexempt from POA reporting for 15 percent or more of discharges. Health care-acquired MRSA hospitalizations were identified as those with a principal or secondary MRSA diagnosis that was present on admission. These stays had at least one health care service—hospitalization, emergency department visit, or ambulatory surgery visit—in the 90-day period prior to the MRSA hospitalization. Hospital-acquired MRSA hospitalizations were those with a principal or secondary MRSA diagnosis that was not present on admission; this indiates that the MRSA condition developed during the hospitalization. The HCUP State Inpatient Databases (SID) are hospital inpatient databases from data organizations participating in HCUP. The SID contain the universe of the inpatient discharge abstracts in the participating HCUP States, translated into a uniform format to facilitate multistate comparisons and analyses. Together, the SID encompass more than 95 percent of all U.S. community hospital discharges. The SID can be used to investigate questions unique to one State, to compare data from two or more States, to conduct market area variation analyses, and to identify State-specific trends in inpatient care utilization, access, charges, and outcomes. The HCUP State Ambulatory Surgery and Services Databases (SASD) include encounter-level data for ambulatory surgeries and may also include various types of outpatient services such as observation stays, lithotripsy, radiation therapy, imaging, chemotherapy, and labor and delivery. The specific types of ambulatory surgery and outpatient services included in each SASD vary by State and data year. All SASD include data from hospital-owned ambulatory surgery facilities. In addition, some States include data from facilities not owned by a hospital. The designation of a facility as hospital-owned is specific to its financial relationship with a hospital that provides inpatient care and is not related to its physical location. Hospital-owned ambulatory surgery and other outpatient care facilities may be contained within the hospital, physically attached to the hospital, or located in a different geographic area. For other information on infectious diseases, including MRSA, refer to the HCUP Statistical Briefs located at http://www.hcup-us.ahrq.gov/reports/statbriefs/sb_infectious.jsp. Agency for Healthcare Research and Quality. Overview of the State Ambulatory Surgery and Services Databases (SASD). Healthcare Cost and Utilization Project (HCUP). Rockville, MD: Agency for Healthcare Research and Quality. Updated November 2015. http://www.hcup-us.ahrq.gov/sasdoverview.jsp. Accessed February 17, 2016. The authors would like to acknowledge the contributions of Valeriy Bakaushin of Social & Scientific Systems, Inc. This Statistical Brief was posted online on October 11, 2016. 1 Centers for Disease Control and Prevention. Antibiotic Resistance Threats in the United States, 2013. September 2013. www.cdc.gov/drugresistance/threat-report-2013/. Accessed July 15, 2016. 2 Elixhauser A (AHRQ), Steiner C (AHRQ). Infections With Methicillin-Resistant Staphylococcus Aureus (MRSA) in U.S. Hospitals, 1993-2005. HCUP Statistical Brief #35. July 2007. Agency for Healthcare Research and Quality, Rockville, MD. http://www.hcup-us.ahrq.gov/reports/statbriefs/sb35.pdf. Accessed September 27, 2016. 3 Evans RP. The Silent Epidemic: CA-MRSA and HA-MRSA. AAOS Now. Rosemont, IL: American Association of Orthopedic Surgeons; June 2013. http://www.aaos.org/news/aaosnow/may08/research1.asp. Accessed July 15, 2016. 4 Dantes R, Mu Y, Belflower R, Aragon D, Dumyati G, Harrison LH, et al. National burden of invasive methicillin-resistant Staphylococcus aureus infections, United States, 2011. JAMA Internal Medicine. 2013;173(21):1970-8. 5 Agency for Healthcare Research and Quality. HCUP Clinical Classifications Software (CCS). Healthcare Cost and Utilization Project (HCUP). Rockville, MD: Agency for Healthcare Research and Quality. Updated June 2015. http://www.hcup-us.ahrq.gov/toolssoftware/ccs/ccs.jsp. Accessed February 17, 2016. Internet Citation: Statistical Brief #212. Healthcare Cost and Utilization Project (HCUP). September 2016. Agency for Healthcare Research and Quality, Rockville, MD. www.hcup-us.ahrq.gov/reports/statbriefs/sb212-MRSA-Hospital-Stays-California-2013.jsp.